When the adjudication of the Lieutenant Governor’s Award for Excellence in Ontario Wines came to an end, the judges took a look at the board at the front of the classroom where the final 11 varietals and blends were written. One thing stood out: the strongest category of the competition was Riesling. Two table wines and one Icewine ranked remained standing after a intensive tasting of 278 Ontario wines. And at the end of the two day long adjudication process, the writing was on the wall so to speak, Riesling keeps on shining through. More than any other variety or wine style, it alone garnered the most praise and attention. Throughout our summer-long blog, Riesling has been described as a grape that is pure, honest, and versatile. We like to think of it as a front-runner among grapes which has the capability of standing out in a sea of bottles. Even in a blind tasting conducted by 14 different palates, despite the difference of styles that the grape is made into, Riesling is charming, seductive. We were thrilled to see so many singled-out as representing excellence in Ontario wines. The Inniskillin 2008 Riesling Icewine, Tawse 2010 Sketches of Niagara Riesling and Thirty Bench 2011 Riesling lead the list of winners for the 2012 Lieutenant Governor’s wine awards. Don’t forget to check out which wines were selected and the Taste Trails blog that details what it was like to be a judge at the second annual Ontario wine competition. 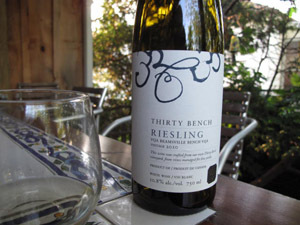 When Charles Baker launched his eponymous Riesling in 2005, he was continuing a project started while working at Cave Spring Cellars. While at the Jordan winery, the sales executive made a Riesling he called Django, after noted jazz guitarist Django Reinhardt. Baker felt adopting the gypsy musician’s name was fitting given he was making wine without owning vineyards or a winery. When he took a job at Stratus Vineyards in Niagara-on-the-Lake, that idea grew in scale and ambition. He was able to create a commercial wine, working in tandem with chef and vineyard owner Mark Picone and the winemaking team at Stratus.